Our approach to recognize and adopt innovation educational training techniques is not only relevant for today but also well positioned for tomorrow. Chapter-wise tests, after the basics and exercise have been completed. The Reading test is 60 minutes long. It has three sections with 40 questions to answer. Please note that the time allotted and the format of the Reading test remain the same for both Academic and General Trainings, however, candidates for IELTS Academic do a different Reading test to IELTS General Training. 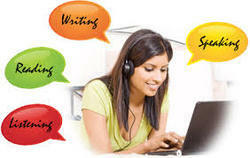 IELTS training is carried out on a comprehensive scale and is in-depth. Batches are formed on roll-on basis. To introduce to the candidates the pattern of the IELTS exam, they are put through an orientation, which explains the details of the IELTS exam, before they join the rest of the class either on week ends or on weekdays.